So I'm really going forward with teaching the knitting lessons, and to help put myself out there, I've created a "Betterist" account over on www.betterfly.com. It's a new site that matches up people who offer services with others who are looking for that particular skill. I'm excited about it, and hope that it will drive business my way. I know many of you all are also skilled in many ways, and it may be something for you to look into as well. You can read over what the classes I offer on my "Class Descriptions" tab. You probably don't know this, but I don't like to drive. This is because I am of the belief that the people around me either drive too fast or too slow, they don't use their signals properly, and myriad other things. However what I ran across the other day while trying to find a parking spot at one of my favorite places, (JoAnn's), totally blew me away. Seriously, the nerve of some people. Now mind you I have nothing against Honda's, my first car was one, but one definitely doesn't need this much space. 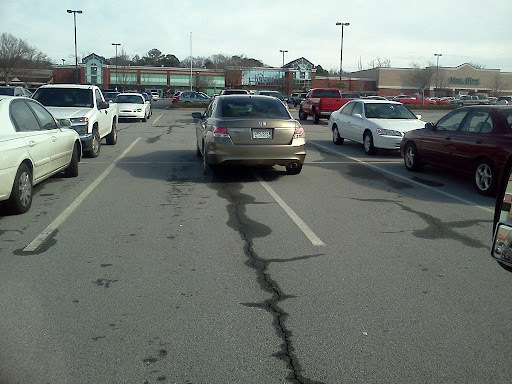 This person obviously didn't learn how to share, or to park for that matter. Well not exactly,....but it was very scary. It was 2:30 Friday when Bella came home and said "Mommy I can't move my neck." I'm thinking 'it's a game', she's just being silly, however when I tried to get her to turn her neck she wouldn't and when I tried to sit her on my lap, she screamed in pain. I immediately called her teacher. We spoke briefly with Bella screaming intermittently in the background, as I would try to move her about. I was trying to get her to rest and ice it, because from what the teacher told me, (and what I gathered from WebMD), it might be a neck strain. Well unfortunately I put my babe through more pain because we had to pick Lynn up from school. She screamed the whole time getting in her car seat. We made it to the school with no problems, chatted with the teacher briefly, again, and went back home. Her neck is still bothering her, but she has more range of motion, but not much. I try icing the spot, but she's not really in the mood, for my attempts at help. At this time I decide to make use of the wonderful insurance we have and call the nurse advice line. During the course of the call I realize she has a fever, now mind you she didn't have one 20 minutes prior to this. The nurse tells me to continue icing, and give Motrin, to bring the fever down and help with pain. If it's not better in a couple hours take her to urgent care. Well by the time my husband comes home, it's time for the older girls to leave for their sleepover, however only one is going, Lani has a fever too. AGH. Bella still has a fever and her neck is still bothering her. Hubby dropped Lynn at the sleepover and came back to take Bella to Children's Hospital. Why is this night so terrible, so horrible, I'm always with my girls, ALWAYS. I take them to every doctor's appointment, visit to the Allergist, all the shots, yup I'm there; but I couldn't be Friday. During that visit I was so anxious, because in addition to "Neck strain" I also ran across "Meningitis", I was terrified, the Internet is the Devil. So when Michael calls and tell me they've done a throat culture and a throat X-ray and now they want to do a lumbar puncture (aka spinal tap) I am so scared. Thanks to my husband who prayed with me on the phone, and Facebook friends who prayed for our family, I was calmed (a bit). I was still aching that I couldn't be there with her to soothe her and comfort her, just hold her hand and hug her. Thankfully we have a wonderful Pediatrician who happened to be on call that night, and was a very effective hand-holder, explaining everything to me in detail. I really appreciate it, because she knew Bella was already at the hospital in capable hands, but she was there for ME. The lumbar puncture was done around midnight, and we got the results around 1:30. It was negative, everything was Negative, Thank God. They made it home around 3:00 and I was so relieved. I cuddled up next to my baby and got a few hours sleep before picking Lynn up (at 8:00 a.m). Side note: Friday was supposed to be Date Night.